Flaunt Edwards is a long-standing alias of J.Rocc The Funky President. Jason "J.Rocc" Jackson has, over the years, become one of the most world-renown and sought-after Hip-Hop DJ's, turntablists, and producers. One of the founding members of The Beat Junkies, J.Rocc has spent time either playing with or recording alongside artists such as Axel F. with M.E.D. Bumrush Bros. D-Styles Sextet, DJ Spinna, Dirty Fingered B-Boys, J Dilla, Jurassic 5, Madlib, and PSK, as well as being the honorary "third member" of Jaylib. The Witzard, actually, has a very special relationship with J.Rocc, as I've been patiently waiting to hear Jay's long-rumored J Dilla & Michael Jackson mash-up/blend album, SHARE MY BED, for about 10 years now. 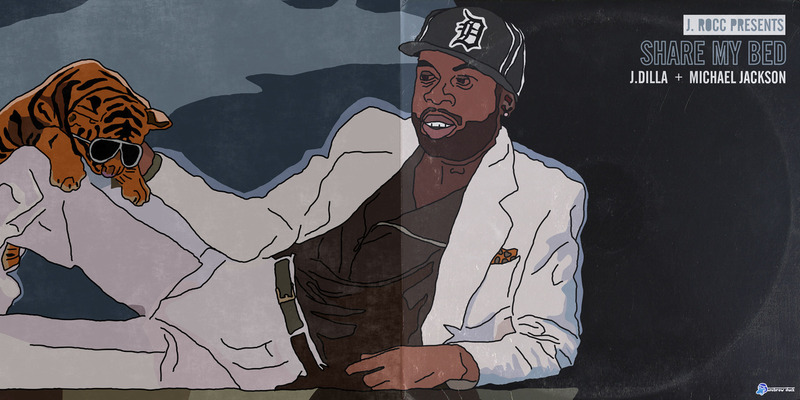 Although, miraculously, earlier this year, J.Rocc surprise released an 8-track version of SHARE MY BED on his Bandcamp page; along with it, was this quote, seemingly, paraphrased from Dilla himself: "J Dilla once said he was gong to make an album of him singing. The cover was a picture of him like Michael Jackson on Thriller. The title of the LP was going to be SHARE MY BED." I soon reached out to my friend and frequent collaborator, unibrow duck (@UnibrowDuck) to see if he could whip up an alternative SHARE MY BED cover based off of Dilla's vision. In a matter of days, unibrow duck had designed a cover image, complete with a tiger cub, and we soon reached out to @jrocc, who, to our surprise, offered to graciously adopt our alt. cover design as the official SHARE MY BED cover artwork! Now, J.Rocc has returned to Stones Throw Records for the follow-up to his 2014 cassette release, Beats On Tap(e). J.Rocc has, over the years, been featured on countless Stones Throw releases and DJ mixes, although, starting around 2003, released a number of projects attributed to his own name on the label, including: Play This (One) 12-inch, Play This Too 12-inch, Stay Fresh 12-inch, Some Cold Rock Stuf, Mystery Tracks EP, The Minimal Wave Tapes: J.Rocc Edits Volume 1-2, and the aforementioned Beats On Tap(e). This brings us to The Name Is Flaunt, J.Rocc's upcoming release attributed to Flaunt Edwards to be released on Stones Throw's sister label LEAVING RECORDS Tuesday, October 30th. 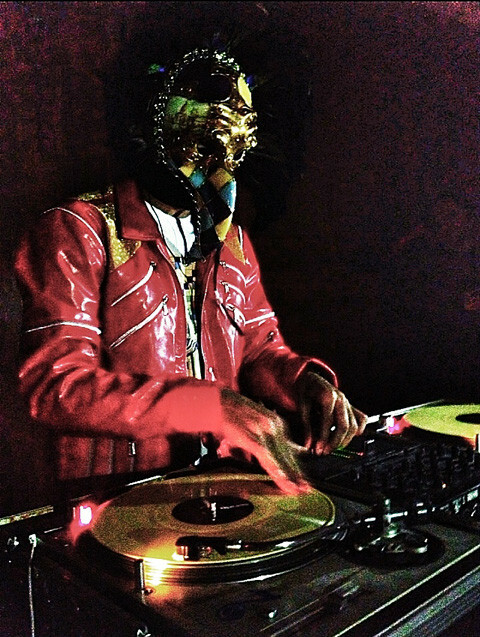 "Best DJ in the world, J.Rocc gives you six bootleg bangers of Electro ecstasy as Flaunt Edwards on 12" VINYL channeling legendary party people like Ron Hardy, Larry Levan, DJ Harvey, and Kraftwerk," Matthewdavid's LEAVING RECORDS wrote within a recent email blast. The Name Is Flaunt is the quasi-follow-up to J.Rocc's previously released—and now, mysteriously scrubbed from The Internet—full-length/bootlegs as Flaunt Edwards, 2012's J.Rocc: Flaunt Edwards Edits and 2015's J.Rocc X Flaunt Edwards - The Edits, Vol. 1. The Name Is Flaunt seems to follow more in the same vein as J.Rocc's edits of Tuxedo's "Do It," 2013's "Wheel me Out" (Edit) & "Rock Creek Park" (Edit,) and Salsoul vs. West End Edits 7-inch. Flaunt Edwards' The Name Is Flaunt 12-inch is now available for pre-order from both Stones Throw & LEAVING RECORDS with FREE digital download available instantaneously, upon vinyl purchase.